Bansomqare Wanna Ransomware is a dangerous malware infection that can infiltrate your system without your noticing it and encrypt all your important files to extort money from you. Although this new ransomware may look serious and it even uses the well-known WannaCry look regarding its ransom note, the truth is that you may just get lucky this time. It seems that there is a free file recovery tool already available on the net, which you can use to restore your encrypted files. But be aware that it may not be a straightforward thing to find it and download it. Obviously, cyber criminals try to take advantage of this and create their own fake decryption tools. Therefore, we suggest that you ask a computer savvy friend or an IT expert to help you with decryption if you do not wish to cause even more issues. Once you have your files back and your system working fine, we advise you to remove Bansomqare Wanna Ransomware right afterwards. Please read our full report to be able to protect your computer more effectively in the future. It is quite likely that you infected your computer when you opened a spam e-mail and ran its attachment. This ransomware infection actually can have a Whatsapp icon to deceive you. This spam can claim anything really that could draw your attention. It may have a subject line promoting Whatsapp as the best way to stay in touch with your friends all over the world, but it may also be about a fine you have not paid yet, a parcel that could not be delivered to your address, or problem with your credit card details. This attached file can pose as an image, a document, or, as in this case, an application like Whatsapp; however, it is really a malicious executable file. This means that there is no way back once you click to view or run this file. You cannot delete Bansomqare Wanna Ransomware without the possibility of losing all your files since by the time you could realize what has happened, your files will be all encrypted. This is also why it is so important that you keep all your browsers and your Java and Adobe Flash Player drivers updated. Unfortunately, you might land on malicious websites armed with Exploit Kits, which means that the moment your out of date browser loads such a page, it drops this infection in the background. The only way for you to avoid such a malicious attack is to stop clicking on unsafe third-party advertisements and links on suspicious websites, to update your programs regularly, and, of course, you can always employ a trustworthy anti-malware program to defend your precious PC against any possible threat. Without these steps you may end up having to delete Bansomqare Wanna Ransomware or any other dangerous threat you may let on board this way. Once this dangerous threat is up and running, it makes sure that it restarts automatically every time you start up your Windows. It is accomplished by setting up a Run registry key, which may have a random name. This ransomware is known to target most of your files, even including certain Windows system files, which may result in sudden application crashes. The encrypted file assume a ".bitcoin" extension that is appended to the original extension. The ransom note, "bitcoin2018.txt," is created in every folder where files have been affected. 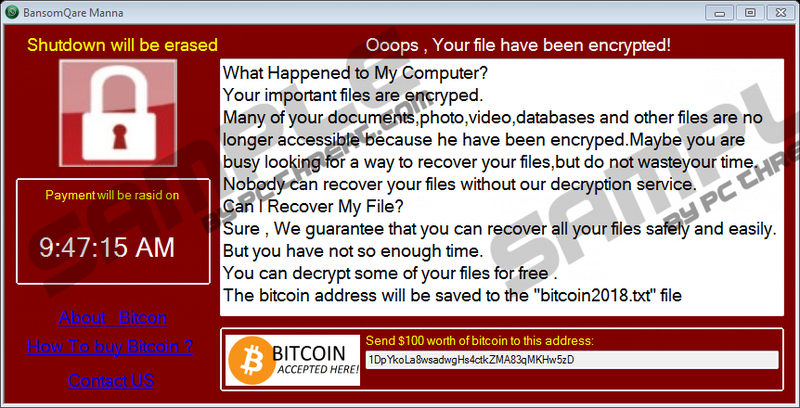 After the encryption is over, the WannaCry lookalike ransom note window comes up on your screen informing you about the attack. You have to pay 100 US dollars' worth of Bitcoins to an address provided in this note. You can contact these criminals by sending an e-mail to "MildredRLewis@teleworm.us". As a matter of fact, you can also send them a couple of small files to get them decrypted for free. However, we do not advise you to either pay or contact these criminals. The best thing you can do now is get hold of the free decryption tool, apply it, and remove Bansomqare Wanna Ransomware from your system ASAP. It may be problematic to remove Bansomqare Wanna Ransomware manually because in certain cases it may crash Windows system programs. We suggest that before you restart your computer or do anything, you should apply the free decryption tool since there is a chance that it will recover the system programs as well. Once you have accomplished that, you can use our guide below to get rid of this dangerous threat. of course, it is understandable that you may not want to risk manual action when it comes to such a severe ransomware program. Therefore, we advise you to download and install a reliable anti-malware program like SpyHunter as soon as possible. We also need to mention that when you cannot start up your Registry Editor because it got blocked or disabled, you can always try to download a trustworthy third-party registry editor program and use that to recover your system. Tap Win+R and enter regedit. Hit the Enter key. Delete the malicious registry key in "HKCU\Software\Microsoft\Windows\CurrentVersion\Run" (could be a random name). Delete every "bitcoin2018.txt" in the affected folders. Quick & tested solution for Bansomqare Wanna Ransomware removal.